When you connect an iPhone, iPad, or iPod touch to a computer, you’ll see a familiar “Trust This Computer?” pop-up on the iOS device screen with two options “Trust” and “Don’t Trust”. If you intend to use the computer with the iOS device users will tap on “Trust”, which gives the computer access to the device. Now, given how easy it is to accidentally tap on “Don’t Trust” which can be reversed, it’s a little frustrating that there isn’t an obvious simple way to ‘UnTrust’ a computer that you accidentally trusted from the iPhone or iPad too, right? Well it turns out you can undo the ‘Trust’ selection when an iOS device is connected to a computer. Before you do this, realize there’s a small catch with resetting the trust certificates from iOS; you’ll end up resetting the ‘Trust this computer?’ alert on the specific iOS device for all computers it has connected to. This basically means the next time you connect the iPhone, iPad, or iPod touch to any computer, it will ask you for the familiar ‘trust’ or ‘don’t trust’ choice again, even if you trusted that computer a long time ago. This is not much of a bother but it is worth pointing out. Additionally, you’ll reset all other privacy and location settings you have customized on the device, so be ready to make some customizations again to those settings. 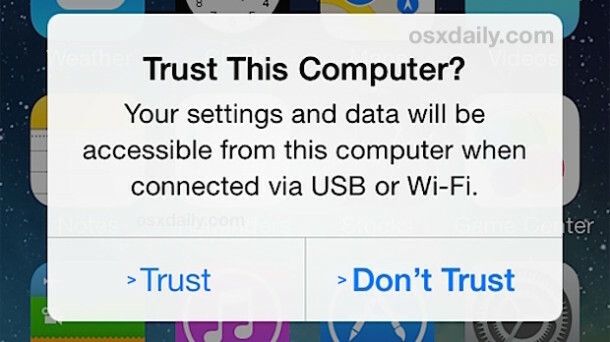 Now if you want to trigger the “Trust This Computer” alert on the iOS device again with a computer, simply plug it back into a Mac or Windows PC with a USB connection and you’ll see the familiar alert screen popping up again, allowing you to select either choice. 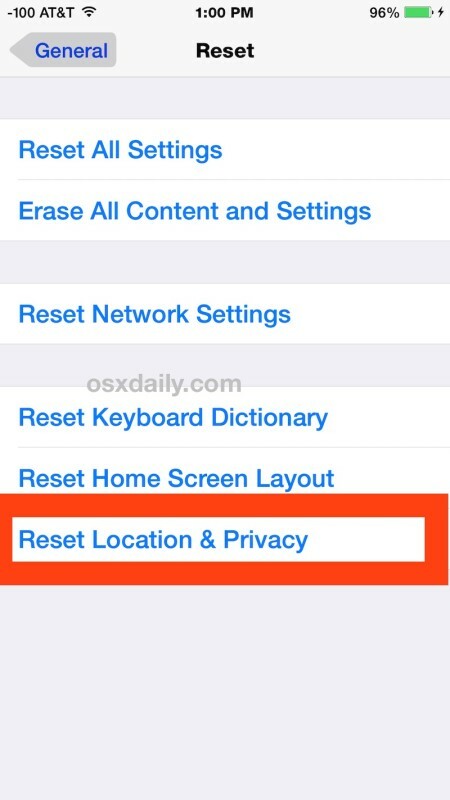 This is a feature that is new to modern versions of iOS, if the device is running an earlier version prior to iOS 8 and iOS 9, users had to reset iOS to factory settings in order to reset the trust settings, or dig around in the iTunes file system of the target computer, both of which is obviously significantly more intrusive and cumbersome. If you know of another method of resetting trust of device and computer connections, let us know in the comments! I keep having an issue where I ALWAYS get the Trust prompt and even though I tap Trust. Any ideas on how to fix that? No idea, but you’re not the only one. I also occasionally get those pop-ups inquiring if I trust the computer. Always thought them odd. Who regularly, habitually plugs in a device to a computer that you don’t “trust”? Who at Apple does what? and then thought up to make this a feature, and then someone else at Apple gave the nod of approval? For what purpose to make it so important? I thunk Apple big wigs are losing their marbles sometimes. I mean, nothing else is more important going on at Apple, occupying everyones time? In other words if you’re at the office or a friends house, you can plug it into the computer without having the computer gain access to the iPhone, but still charge the iPhone from USB. Also if you hit ‘don’t trust’ it does not store a certificate of the device UDID on the computer, leaving no trace it attached to that computer. For forensics, secops, etc, that is important. And of course, the opposite applies too, ‘trust’ places a lockdown certificate onto the destination. Yes, of course at the office or a friends house just plug it in and don’t give it a second thought. Why would you even care at the office or a friends house if it left a certificate or trace of any kind? So what if it did, and you never knew about it? The potential for maliciousness is minuscule. The point is, the people at Apple must plug their devices into unknown machines frequently, yes? Seriously, when was the last time you or someone you know plugged a device into an unfamiliar computer? It’s so rare, but for some reason plugging devices into machines raised eyebrows, concerns to certain people at Apple. My I pad won’t sync to windows 10, any idea why? Be aware that this also throws away iTunes Wi-Fi Sync for the device–probably obvious, but needs stating anyway. It’s usually a good idea only to have one device so you can easily see the sync process in Settings > General > iTunes Wi-Fi Sync. Why Apple didn’t just call this “Sync” and allow you to toggle Wi-Fi Sync from here while also allowing you to swipe to delete or allow you to edit, I have no idea. Too much acid, I suppose. You can also “Reset Network Settings” to achieve the same thing, albeit that you will still need to reconfigure networking which IME is less work than Privacy. The idea for requiring trust is a lot more than “just charging at a friend’s computer”. There are charging points everywhere — in coffee shops, in airports or even in gas stations. There have been many reports of devices’ data being stolen because these public charging points weren’t there just to charge devices — they would look through and/or download your data. THAT’s why you need to establish trust. This isn’t working for me. I did all the steps, plugged my phone back in and it just went right to the folder. Anything else I can try?